Mark instructs in our kayak and canoe programs and is our dedicated repair and outfitting technician. Mark is semi-retired, and the half that is still working works at Undercurrents. Mark calls it “the best job in the world” and he is still surprised that someone would pay him to work on boats all day and hang around in a paddling store. 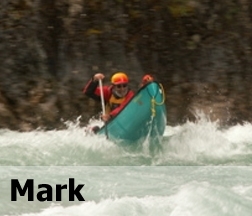 Mark is an accomplished woodworker and long-time paddler with lots of experience repairing and outfitting boats. To learn more about the wide variety of repairs and outfitting that Mark is skilled in, just visit the repair page on our website. Mark paddles on the left side of the canoe, so he taught everyone in his family to paddle on the right side of the canoe. Now he always has someone to canoe with him! Both of Mark’s sons have worked for Undercurrents for years, and his wife, Val, even did a stint working here. That’s the whole family! Mark and family own more boats than anyone we know. We are jealous!